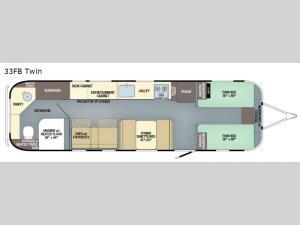 If you enjoy traveling with the comforts of home, then take a step inside this Airstream RV Classic 33FB Twin travel trailer where you will find a front bedroom with two 36" x 80" twin beds, plus plenty of other conveniences. If you have a little work to do then the desk cabinet will be handy. The rear bathroom is spacious and has a large wardrobe plus a 36" x 44" shower with a heated floor. No matter how long your journey may last, you will want an Airstream Classic travel trailer. You will enjoy plenty of features such as a Multiplex control panel that with the touch of a button you can control lighting and technology. While you are away from home you can enjoy a variety of entertainment features such as a Polk stereo with XM/AM/FM Satellite radio and Bluetooth, a 65" or 32" living room TV depending on the model, plus a Blu-Ray DVD player. Each kitchen has enough features throughout to make you feel like you are still at home from the three burner gas cook top to the Corian countertops you will enjoy all of the space!